For months, I’ve been trying to write a single blog post. This is that post. Marriage is an important topic to me and was one of my original aims to address with this blog, as shown here, here, and here. A month and a half ago, I began writing what I’m calling my “hindsight” posts, that will go through some of the tough times we’ve recently had living the L.A. life with a family in tow. The next one I’d meant to write was going to be about marriage in honor of our 9 year wedding anniversary on 10/1, but I’d had a friend visiting and didn’t get to it. And then, on 10/2, just when I thought our lives had finally settled down some, some poop hit a fan. Just a small amount of poop and just a small fan in the grand scheme of things, and we’re now back on our feet and perhaps even better than before. But this marriage hindsight post still needs to be written. Marriage is hard. We all know that right? Everyone says this. I say it often enough, you probably say it too, and most people agree with this statement. But what does that mean? How hard is ‘hard’? Is marriage ‘hard’ when one spouse annoyingly rolls the toothpaste tube and the other squishes it? Is marriage ‘hard’ when one spouse thinks the other a slob for leaving their clothes on the bedroom floor? Is marriage ‘hard’ when two spouses disagree with how their money should be divided, shared, and spent? Does marriage get even harder? How hard does it get? Is there ever a “too” hard? 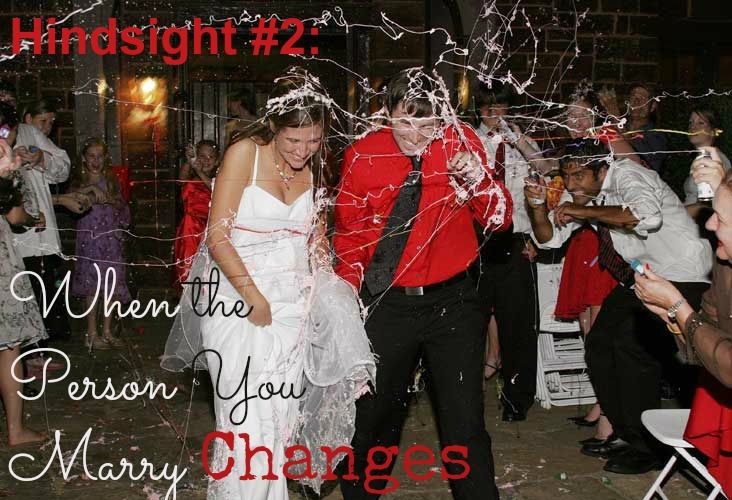 What happens when the person you marry changes? Sooo…let’s go back in time real quick. Fall 2012. The phone call that started it all. As KP and I entered into a time period that brought a good deal of financial difficulty, we also unknowingly entered into a time period that brought a good deal of marital difficulty. In hindsight, it’s easy to look back on that time period and see that we were just trying to make things work the best we each knew how to, both of us handling a difficult situation in our own way. But at that time, all we could see were our relationship struggles and incompatibilities. After all, as life passes, and as people experience and adapt to whatever new circumstances are thrown their way, it is normal and expected for them to change and grow. And THIS is why marriage is hard. Because people are individuals. Our marriage got hard because KP and I are two different people, who’d each changed and grown independently, and who responded to our shared difficulties with vastly differing perspectives. You often hear people, at difficult points in their marriages, say “He/She’s just not the same person I married anymore” as though that’s a valid excuse to give up. Maybe people don’t get this. Maybe KP and I didn’t get it either. Maybe no one really understands at the time they get married. But the person you get married to will not be the person you stay married to. The guy I’m married to is no longer this guy. We all change over time. I’ve changed. KP’s changed. It is impossible to know absolutely everything about someone before marriage. During our darker days, I wondered how I’d gotten myself into this mess – had there been huge red flags I’d somehow missed before we’d gotten married? Something I should’ve seen that would’ve indicated this incompatibility? Did I even know who KP was before I agreed to marry him? Was I doomed to this unhappiness in marriage forever? Would life be easier if I were doing it on my own? In early 2013, I had a heartfelt conversation with an old friend, who was also having some struggles in her marriage. It was wonderful to have someone to vent things to, someone who could relate that life isn’t always perfect, someone who could understand. However, at the end of the conversation, she asked a question that has stayed with me for a long time as kind of a defining moment in my commitment to making my marriage work. She asked me if I’d ever consider divorce. I solidly said told her no, that I’d rather be unhappily married, and hope that things would get better one day, than to give up and be divorced. She seemed a bit surprised at this, that I would rather choose unhappiness and stick to the principle of marriage, than to seek my own happiness and ‘freedom’ in my own life, even if that meant divorcing. Her surprise at my response was actually a bit surprising to me, as we’d both come from similar conservative upbringings, and we’d often had very deep and truthful conversations about life. To be honest, I felt a tiny bit betrayed; if even her resolve for the worth of sticking through marriage during the tough times was waning, then where else was I to go for the marriage encouragement I so desperately needed and wanted? It was at that point that I made a decision that I believe made all the difference, at least for my end of the marriage. I decided that I would never let the seed of divorce plant itself in my head. I would never even consider it as an option. Because I knew that if I did, that I’d be watering that seed each and every time I entertained thoughts of what non-marriage could be like. And the more the seed would be watered, the more and more it would take root and grow. So I refused to even plant it. Things have not always been easy, but KP and I have trudged on. Sometimes it felt like we took one step forward only to take two steps back. We’d manage to have some great times together – and then something would set us off on a spiral of a fight that we wouldn’t resolve but just smolder out on its’ own a day or two later. Slowly, very very slowly, things have gotten better, and are still getting better. Financial standings have improved, our life outlooks have changed, we’ve both come to terms with things, and a lot of the outside stress that was plaguing our marriage had dissipated and we’re able to talk more. I’m now at a point where I can even write about this, and that in and out of itself is a big deal. I am even more grateful for and thankful for and have more love for KP now than ever. I may not have a psychology degree and don’t claim to know everything (yet ;)), but as someone with 9 years of marriage under my belt? My best suggestion for your best chances at a successful marriage is to find someone who is 100% against divorce AND who esteems achieving a happy and successful marriage as a highest priority. If you find someone like this (and you yourself are like this too), then no matter what you face in life, you will both always be willing to make changes in yourself to be the best spouse you can be to each other. The part that seemed to be the most relateable to me was the idea of the below. The study quoted refers to couples as either “masters” or “destroyers”. So yes. Marriage is sometimes hard and marriage is sometimes easy. It’s a journey with hills and valleys. Two and half years ago, I would’ve never been able to foresee the struggles we were about to enter into, and when we were at the darkest times, I was hardly able to foresee a future where it’d be better. But in hindsight, now that we are past (what I hope to be) the worst, I wonder if it was perhaps the experience we needed in order to bring us to where we are, and to the people and spouses we are, today. I have so much more I could say on this topic, and I hate to end abruptly, buuuut KP is home and we are wanting to watch this weeks episode of Parenthood together, which actually, works out to be a kind of fitting way to end this post. Maybe I’ll do a followup afterward. Ahh, Parenthood. I’ve loved you from the beginning, but have felt a bit strung along recently with the Joel and Julia’s crumbling marriage story. I still watch though, because obviously, I’m Team Joel. All the way. From the very beginning. They’d better work it out. And yes, I’m probably overly-involved in this storyline on a fictional tv show. But seriously, we NEED examples in the media of marriages succeeding! Come on Joel and Julia – marriage is worth fighting for! Thank you for sharing. This is very true. When I heard “marriage is hard” before I got married, I thought I knew what that meant. Boy was I wrong!! We have also had our high highs and low lows, like everyone. I have a friend who is divorced and we both realize that the grass looks greener on the other side of both of our situations. That’s because both have their issues. I agree. Find someone honest, who does not consider divorce an option. That may not be foolproof advice, but that would be a good start in finding a forever mate. Thanks for commenting Megan – a marriage relationship is so much more complex than I think most people are aware of! That doesn’t mean marriage is doomed though, but just it’s not simple and easy. I appreciate your honesty and believe you are SO right. Mike and I resolved at the beginning to never use nor think about what we called “the D word”. It has worked and kept us working through the challenges knowing we stick with it and come out on the other side. Marriage isn’t for sissies, that’s for sure! I applaud you for your resolve. You won’t regret it! Loved seeing your house, which brought me to this. We are almost to our 25th anniversary. Our bottom-line values so linked, our personalities, styles, everything so different. Incredibly wounding story of sterility, not infertility. Serious financial difficulties after “splurging” on adoption. I seriously considered divorce at the 18 mo to 2 year point, So glad I didn’t. This to me is the bottom line (sort of built off of the book The Meaning of Marriage.). God is very relational, and He loves covenants…promises to stay in relationship no matter what. And so we marry. It is a joining hands and then trusting God that whatever happens after that is filtered by Him and He will use it for good. That good is remaking us into someone with the DNA of Jesus (Romans 8:28, 29). Parenting, too, is a covenant (in adoption, this has its own challenges). And we have had some horrible seasons, but in the long run, I wouldn’t trade it for anything. Great post! As someone who was married since the age of 18yo,and married 31 years now, I can attest to the fact that people change on both ends. It is inevitable through life’s experiences-but the core of who you are remains the same. Wait til your guy hits “man-o-pause”-and of course,we will go through our own changes-through each birth,menopause,mid-life crisis,etc. One thing is constant-that is change. I do agree with you that you have to have commitment. For different reasons,we are both committed to our families and we do not want divorce. To me it is easier to stick with him than go through divorce and impact the kids. If my kids are no t happy,then how in the world will I ever be happy? My teen daughter just came up to me yesterday telling me about a friend who broke down crying bc her mom is leaving the family this weekend and that the parents have been fighting, My son’s little friend hates to go to two different houses and that is parents fight still and he is in the middle. My kids have told me thank you for not putting them through this type of thing and we show them family is a strong bond and if we fight, we work it out and not run. We are committed not only to each other,but to the family. And through the ups and downs of life-main thing remains constant too-is that as I look back, I love him more than ever now-like my dh says-it is an even DEEPER love because of all we went through! Absolutely right. Time and life experience change you as a person and a relationship as a whole. I think it’s important to work through your differences. My husband and I got together nine years ago, when we were still in high school. Now we’re grown and are still in the process of major life changes. Ups and downs, rough times. We’ve been through challenges and I’ve learned how to love him through it. It’s good to have a reminder every so often.